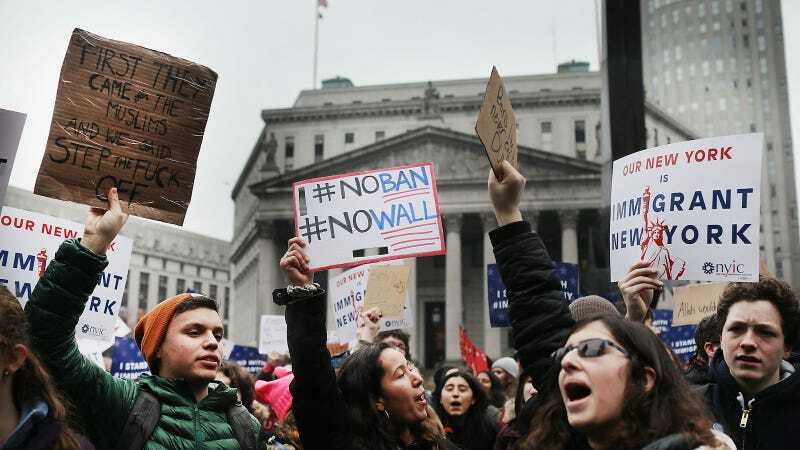 MANHATTAN—On Tuesday afternoon, hundreds of New York City teenagers walked out of their high schools and headed to lower Manhattan where they protested Donald Trump’s immigration and refugee ban. They gathered at a rally in Foley Square co-sponsored by the New York Immigration Coalition, Arab American Association of New York, and MPower Change to hear city officials and organizers like Public Advocate Letitia James and 17-year-old Hebh Jamal speak against the executive order that indefinitely bars Syrian refugees and temporarily bans nationals from seven Muslim countries. The group then marched to 26 Federal Plaza, the local immigration and naturalization office, where a group of students cried, “Let them in!” and “Muslim Lives Matter!” Coincidentally, the demonstration occurred just as controversial nominee Betsy DeVos, a GOP billionaire donor with no experience in education policy, was confirmed as Education Secretary. Atia, 15, heard about the protest from a classmate who organized a group of about 50 students at the Brooklyn Latin School. While her school’s administrators didn’t actively encourage students to protest, Atia said they have been very pro-immigrant and security guards escorted student demonstrators to the subway. Not everyone felt encouraged by their school, however. Emma, a senior at New Explorations Into Science, Tech and Math High School in the Lower East Side, said that her school sent a memo to parents urging them to not allow children to attend. She and several of her classmates managed to sneak out anyway, she said. For her and several other teens, the anti-Trump protest was not their first, and certainly not their last in the next four years.